When hearing in natural settings, or listening to speakers, the sound elements arrive at your ears at different times due to distance, wall reflections, bouncing off other objects in the listening environment, and even off your shoulders and parts of your head. A sound that comes from one direction (say from the left), even though it is heard by the left ear first, is still heard in a lessened manner by the right ear as the sound passes through your environment. All these factors provide information regarding the distance of the sound sources from your ears. How sound interacts with your head and ears is referred to as the HRTF (Head Related Transfer Function). In addition to HRTF, the characteristics of sounds coming at you change as you move in your environment, as well as moving objects emitting sound change their distance from you (resulting in The Doppler Effect). Unlike hearing sound in the natural world or via speakers, when listening to audio (either music or movies) using wired headphones or headphones connected wirelessly to your TV, the sound seems to originate from within your head, which is unnatural. Even sounds entering your ears from left or right in a headphone environment sound like they are on the left or right side of your head, instead of a distance from it. The reason for this is that when wearing headphones, all sounds arrive at your ears at the same time, which means there are no distance cues and no natural sound reflections, thus negating the HRTF effect. To compensate, there are various techniques that can be employed for headphone listening that deliver sound with more natural depth that can more closely approximate the characteristics of sound arriving at your ears as it might with your ears exposed to the natural environment. Even the use of open or closed headphones can impact the sonic signature. With stereo, expanding the sound field is a matter of placing center channel sound elements (such as vocals) in front of you, while the left and right channels are placed farther from the left and right of your head. With surround sound, the task is more complex, but it is possible to place left, center, right, left surround, right surround, or more channel (surround sound) cues accurately in the "space" beyond the borders of your head, rather than inside it. Dolby Headphone – When combined with Dolby Pro Logic II processing on a home theater receiver, you can expand two-channel content to surround sound. Some headphones have Dolby Headphone processing built-in. DTS Headphone:X – Not only provides a horizontal surround environment but can also provide overhead sound cues with compatible content. Yamaha Silent Cinema – Can use any pair of headphones connected to any Yamaha Home Theater Receiver, HTIB (Home Theater-in-a-Box), or sound bar that provides Silent Cinema audio processing. Auro 3D Audio (for headphones) – Provides an immersive sound environment with both horizontal and overhead sound depending on content. Dirac VR – For music, one can use any pair of headphones with a home theater receiver or mobile device that features Dirac headphone surround sound processing. For audio/video VR application, compatible VR headgear system and content are required. Dirac VR processing includes head-tracking capability - if you turn your head, the sounds still come from the proper direction, just like when you are listening to room speakers or natural sound. Smyth Research – Requires the purchase of a special audio decoder/processor that provides inputs for sources, such as CD/DVD/Blu-ray Disc players, and USB flash drives. Includes similar head-tracking capability as the Dirac system. The above technologies employ algorithms that create a virtual surround environment that not only gives the listener an enveloping sound but removes it from within listener's head and places the sound field in the front and side space around the head, which is more like listening to a regular speaker-based surround sound system. Plug in any set of headphones to the headphone jack, activate an appropriate format listed above that you may have access to, and you can listen to surround sound without a soundbar or a lot of speakers. All of the needed surround headphone audio processing for each method is incorporated into the Home Theater Receiver, Preamp, Surround Sound Processor, or another compatible device, that you would plug your headphones into. Also, these technologies can also work with wireless headphones (Bluetooth is limited to Stereo). For home theater, check to see if your home theater receiver (or one that you may be considering) features Dolby Headphone, Yamaha Silent Cinema, or other headphone surround sound processing system that allows the use of any set of headphones. However, even if your home theater receiver or another device that provides headphone listening doesn't come with built-in surround sound headphone processing, with some headphones, you can still access a surround sound listening environment. Another type of approach to headphone surround sound is by German headphone maker, Ultrasone. What makes the Ultrasone approach different is the incorporation of S-Logic. The key to S-Logic is the position of the headphone speaker driver. The driver is not located in the center of the earpad, where it would send sound directly to your ear, but slightly off-center. By placing the driver in an off-center position, the sound is sent to the outer ear structure first, where it is then funneled into the middle and inner ear in a more natural fashion. In other words, the sound is heard as it would be in nature or when listening to speakers; the sound reaches the outer ear first and is then sent into the middle and inner ear. This approach can work very well. There is both an increased expansiveness and directional perception of the soundstage. Instead of the sound just coming at you from left and right, the soundstage opened up to the beyond the earpad borders. Sound appears to originate from slightly above and slightly behind my ears as well as slightly from the front. With music, voice and instrument placement was very precise and distinct. The degree of the Ultrasone effect also depends on the source material being played. Although listening to DVD and Blu-ray surround soundtracks with the Ultrasone S-Logic system is not the same experience (rear sound effects are minimal) as when listening to an actual 5.1 or 7.1 loudspeaker setup, it is still credible. One drawback is that the center channel is not placed at quite enough distance forward; it is more in the center of, and slightly above, your head. On the other hand, the left, right, and surround effects have enough spaciousness and direction. Ultrasone has taken an innovative, yet simple, approach to headphone listening to that is well suited for listening to either music CD or DVD/Blu-ray/Ultra HD Blu-ray soundtrack material, and there is no additional equipment or special sound processing requirement other than the headphones. The effect is available with any amplifier or receiver with a headphone connection. Another headphone surround sound listening option is provided by Sennheiser and Sony. Their systems combine wireless headphones with a special headphone surround sound decoder/processor/amplifier. You can plug one, more source devices into the "processor", transmit the audio signal wirelessly to the headphones and listen to either stereo or virtual surround sound. Creative's Super X-FI Headphone Holography requires the installation of a special Android or iPhone app that uses your phone's camera to take pictures of your face and ears. Using the image information, the app maps your head. After mapping, you need to connect a Super X-Fi headphone amplifier (or use a headphone from Creative that has the amp built-in) and sign up for an account. The Super X-Fi app downloads the mapping information and headphone selection into the amp to provide the best possible listening experience with the sound appearing to come from speakers set a distance away rather than from inside your head. Super X-Fi Holographic Sound can be experienced from sources such as Android and iPhones, Macs and Windows PCs, the Sony PS4 and Nintendo Switch, with more to come. In addition to the headphone surround sound solutions discussed so far, there is an additional approach that is targeted for the console and PC gaming environments. 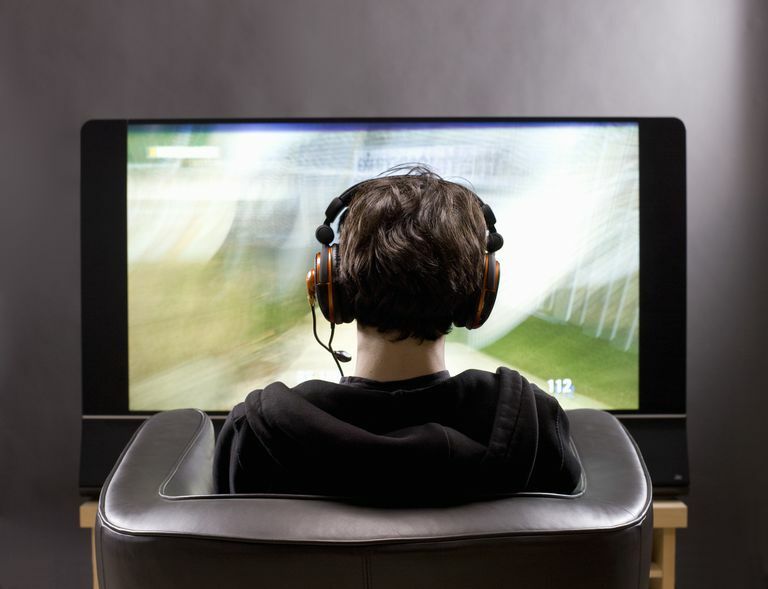 This option utilizes headphones that connect to an internal decoder/processor in the console or PC (installation of additional software may also be required) or an external decoder/processor placed in the connection path between the gaming console or PC and the gamer. The result is an intimate immersive virtual (such as DTS Headphone:X or Dolby surround) listening experience that complements the visual gameplay. Razer - One Razer model, the Tiamat 7.1 V2 actually has 5-drivers (4 mid-range/tweeters and one subwoofer) in each earpad and the headphones connect to a special audio controller that incorporates discrete 7.1 channel surround sound processing that is placed between the PC and headphones. There are several ways to access surround sound for use in a headphone listening environment. Make use of virtual or digital sound processing technologies that can be used with any pair of headphones - However, you need a home theater receiver or playback device (that has a headphone connection) that has the desired surround sound processing built-in. Use special headphones that can create a surround sound listening environment with any amplifier or receiver with a headphone connection, regardless whether the amplifier or receiver is equipped with dedicated virtual or DSP technology for surround sound headphone listening. Use a system that pairs wireless headphones with an external decoder/processor/amplifier. For gamers, use an option that combines specific headphones with additional decoding/processing techniques that can be performed by your console/PC or a device that connects to your console/PC and the headphones. All four approaches work, it really boils down to what option is best suited for your listening needs.